The Levtex Kids Fiona 5 Piece Toddler Set is a Toys R Us Exclusive! 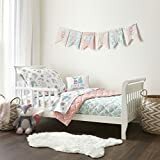 This is a cute and comfortable woodland themed Toddler Set with a reversible quilt featuring an aqua medallion on one side and a coral geometric print on the other. The Set also includes a woodland themed Flat Sheet, Fitted Sheet, and Matching Pillow Case with a fun animal print that features peacocks, foxes and birds in coral and aqua hues, and a Decorative Pillow with an adorable textured fox and the sentiment “I Love You a Bushel and a Peck”. This Toddler Set will help you to create a wonderful and lovable room for your child. 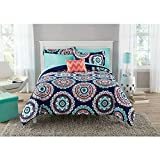 Quilt: 42 inch x 57 inch, Fitted Sheet: 28 inch x 52 inch, Flat Sheet: 45 inch x 60 inch, Pillow Case: 20 inch x 26 inch, Decorative Pillow: 10 inch x 12 inch.